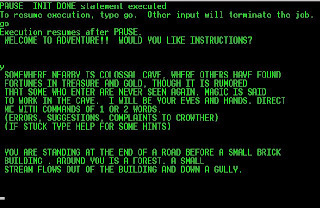 No this blog post is not about this kind of adventure, though that would be pretty fun still today, me thinks. (confession of a computer geek.) Today I was facing the pre-20 miler 4mile warmup. Our weather had been having an identity crisis trying to determine whether it was an intense blizzard or just a torrential rain fall. Thus I politley announced that perhaps I would find my way to the treadmill. It was at this point that "teh wifey" suggested I was losing my sense of adventure. Losing what? ! I've lost quite a few things, my ability to run under 6:00 miles, my wallet every other day, and clearly my mind, but NOT my sense of adventure. Thus I took off on the four mile loop that follows a trail bordering a creek/river. I'd normally say it is a large creek, but when the snow and moisture has been dumping for an entire day, the thing swells and becomes a raging river. This makes the four mile loop rather interesting. When it is in creek form, in a particular place of the trail you have to jump from rock to rock to get across and avoid getting wet. In river form, the trail is entirely engulfed and impassable. EXCEPT for those who have not lost their sense of adventure! In this kind of adventure I had to fight through the inches of snow on the path and then get through a couple feet of racing water. The water was a wee bit cold (outside temp of 32) however the most prominent thing that makes this water adventurous is the filth, as in all the garbage, refuse, feces, hypodermic needles, and whatever else the water washes off and into the river. Now THIS is adventure! Who knows what terror lies in the murky water that was up to my knees? If I slipped at this point, I could be washed away into a sewage treatment plant, never to be heard from again. OK so this "adventure" is pretty mild really, but I like to build it up into an epic tale of wanton abandonment to the cause of running. It sounds so much better than 4.0 in 44:12.
but since you have, I guess I can get an autographed picture of my quads. Don't let word get out, though, cause I don't have the resources to fill any huge orders. Good thing you didn't step on a needle or any crap! EW! !